Watch No Better Cause on YouTube. No Better Cause is an award winning a cappella group from Lincoln, Nebraska. 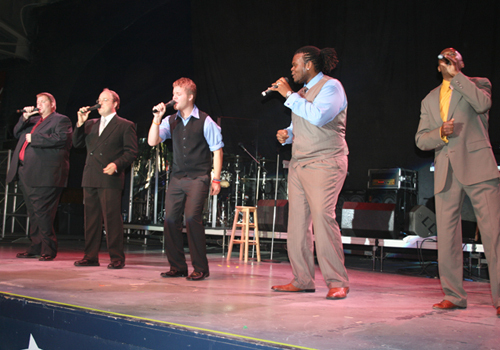 Since 2002 when the guys were in college, No Better Cause has enjoyed traveling and performing all over the United States for all sorts of events. This isn’t your typical a cappella group, though. No Better Cause is made up of three tenors, a rumbling bass singer, and a rhythmic beatboxer who makes all drum noises with his mouth. With a unique assortment of both original songs and uniquely arranged covers, No Better Cause is guaranteed to deliver a show that people of all ages can appreciate and enjoy. After taking a few years off to start families, No Better Cause is excited to be back at it and better than ever beginning in 2018! The guys have recorded one new album which will be released in August of 2018. And they are working a second album (their tenth) which will likely be released sometime in 2019. Through hard work and a strong dedication to music, No Better Cause has become accessible to almost any venue or setting, making sure that their music and repertoire can always compliment their diverse audiences. Every year, No Better Cause is booked to sing at countless county fairs, churches, college campuses, corporate events and sporting events. The band has also been widely recognized for having one of the most precise and interactive school workshops of any music group around, becoming an annual guest of elementary, middle and high schools everywhere. Through the amazing support of their family, friends, and wonderful fans, these five men have been able to display their talents doing what they love most, and there is certainly No Better Cause than that. Technical requirements: No Better Cause prefers a 16' x 24' performance area, though this is not a requirement. We recommend the presenter provide professional sound as it will usually save on cost. No Better Cause will provide required wireless microphones, which is included in the booking fee. No Better Cause will also provide any additional sound equipment necessary that is not provided by the presenter. Availability: No Better Cause does not have travel restrictions.